Each world stretched across vast millennia. Each saw civilizations flourish before dying, scattering, or transcending. Those that ruled these worlds spoke to the stars, re-engineered their bodies, and mastered form and essence. Explore the vast, fascinating, and unique setting of Numenera - the Ninth World. Gather your friends, open this box, and begin playing right away! The game is easy to learn and fun to play. 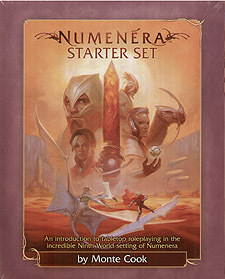 Whether you're new to Numenera or new to roleplaying games, this box has everything you need to get started. A perfect introduction to the Ninth World, this complete tabletop roleplaying game take 3-6 players on their first journey into the science-fantasy world of Numenera.